Lucina Villa is a large detached villa with it's own private swimming pool (can be heated if required) set in the popular Universal area of Kato Paphos ideal for your summer holiday vacation. The villa offers a spacious lounge with a large modern separate dining kitchen. The kitchen is fully equipped with all that you would possibly need including dishwasher. It’s private rear paved patio overlooking the pool is ideal for dining al fresco with family and friends and provides an excellent setting for enjoying relaxing evenings. A downstairs toilet is located near the pool for convenience. All the floor areas are stylishly tiled with a wonderful marble staircase leading to the first floor. The first floor has a large double bedroom with its own en suite and patio doors leading to a balcony. There are 2 further large double bedrooms with 2 twin beds in each one and a separate bathroom. There is ample off street parking. The villa has air conditioning throughout, UK Broadband TV and wireless Wi Fi Broadband. Having enjoyed family holidays in cyprus we fell in love with Paphos, its culture, friendiness and laid back way of life. We took the plunge and bought a villa in 2008 to enjoy future holidays. The villa's spaciousness and 25 minutes easy walk on the flat to the shops, nightlife and harbour met all our requirements for a holiday base. We liked the fact the villa was detached with a private pool set in a garden not overlooked by neighbours. We installed a Pool heating system to make swimming a pleasure in the spring and autumn when usually the pool is cold. There is unlimited download WiFi broadband which allows the whole family to use with no large unexpected bills. Broadband TV provides Freeview BBC1, ITV etc so all your favourite UK programmes are available. Large bathroom with bath and shower above. Master bedroom has its own ensuite shower room. Unlimited Broadband Wi Fi for connection to Laptop, Ipad, Iphone etc at no additional cost. Hand, Bath and Beach towels provided for your use. Large fully equipped spacious kitchen with cooker, washing machine, dishwasher, fridge/freezer and dining table and chairs. Dining table and chairs in the lounge, further table and chairs in the large kitchen and outside on the Patio area. Secluded with green belt behind for privacy and relaxation. Villa close to 4 excellent golf courses. Situated in secluded rear garden. Option to heat the pool in cooler months. Notes to the accommodation: There is a separate modern fitted kitchen with cooker/oven, fridge/freezer, washing machine, dishwasher, microwave, and all the necessary kitchen utensils. There is a large lounge with dining area with seating for 6 and UK Broadband Freeview TV, DVD and Video. There is Wi Fi Broadband for wireless connection to laptops, netbooks, ipads and iphones with no additional cost. There are 3 spacious double bedrooms in total on the upper floor with 2 bathrooms (1 en-suite). The rear bedroom has a balcony which overlooks the private pool below which is situated in an extensive secluded patio area to the rear of the villa and the large green belt behind ensures privacy. Full collection of outdoor furniture including table, chairs, sunbeds and umbrellas. The property itself was ok. The area was not as implied by owner. Nearest town on foot was 25 minutes and not 15 minutes as told. Area very noisey and congested during drop off and collection times of school. Parking was also a problem during this time. The school playground was used as a meeting point in the evenings by local youngsters with cars playing loud music all through the night. The air con in the property for which an extra charge is required was on timers with the maximum time only being 2 hours, so nights were hot and interrupted. The pool was so cold it could not be used. We contacted the owner who instructed his caretaker to come round and turn on the heating for the pool. It took 3 days for the pool to acquire a reasonable usable temperature. We was charged £100 out of our deposit bond for the 12 days we had left of our holiday. We only had one set of towels to last our whole holiday of 3 weeks. Owners rules and regulations are very off putting. I would not return to this property or rent any villa from this owner again. I travel regularly all over the world using this site for private owner villas and I have never experienced anything like this holiday. Many areas of disappointment,but too many to list. Would not recommend to anyone. We are sorry to hear that you did not have a good holiday. We have rented out our villa for the last 8 years and have received many positive comments and feedback from guests. The location of the villa is clearly marked on the Home and Away website and it is also clearly stated in an information email we send all our guests prior to booking that it is a 25 minutes’ walk to the harbour, bars and restaurants. We also send a detailed map showing directions. The area in Universal is in a quiet location and disruption from the local primary school is minimal – 10 minutes at drop off and collection. There is ample street parking and also a driveway at the villa and we have never had a problem with this. We visit the villa regularly ourselves and have never experienced any noise at night and have never had any feedback from any other guests stating this - I’m sorry you had a problem. The air con is on timers because in the past the units were left running day and night which is not only costly but bad for the environment. When in the villa you can use the air con as much as you want by using the remotes and we also provide a large fan for the bedroom which can run through the night. We have a heated pool system but this was not requested at the start of the holiday. When requested it was switched on immediately. It takes a few days to heat the whole pool due to the volume of water. As advertised on the website the cost is usually £15 per day and we did not charge you for all the days. We offer a linen and towels changeover service direct with our management company but this was declined – most people decline this as they are happy to use the washing machine – we supply 3 towels per guest. I do not feel that we have onerous rules – no smoking in the villa and rules that ensure the safety of our guests when staying. We have a great management company and we ourselves are always contactable by phone if any issues arise. We appreciate that everyone has different expectations in a holiday and as previously stated we have had very positive comments from satisfied customers in the past and the villa is well suited for families. Quiet location, spacious rooms,secluded pool area. The layout of the villa is great - one large living space and a large kitchen plus a toilet downstairs, 3 good sized bedrooms and 2 bathrooms upstairs. The pool area has plenty of space around the pool for loungers and for table and chairs, and the area is not overlooked at all by other properties. There are plenty of facilities in the living area although we did not use them all - TV/DVD/VHS/satellite/stereo/CD. The furniture in the living area is new and modern. There is good working AC in every room. There was clean linen on the beds and 3 towels were provided for each person including beach towels. The kitchen has everything that you would need in good working order. The villa was very clean and is clearly well maintained, and the pool was cleaned several times during our 2 week stay. The owner was very helpful in all contact prior to arriving making everything easy, there was plenty of information provided about the villa, the facilities/appliances/machines etc. the area, even driving in Cyprus, and everything was found as expected. The villa was great for our children and the location was perfect - being in a quiet residential area yet just a 5 minute drive from Kato Paphos main areas. I would strongly recommend this villa for a holiday in Paphos. We stayed for 2 weeks in July and had a fantastic holiday. The owners are extremely thoughtful and supply everything to make the place a home from home. The villa was extremely spacious with a large private garden with its own pool. Thoroughly enjoyed making use of the BBQ and the weather was excellent. The accommodation is furnished to a very high standard and found everything clean and ready to use on arrival. Would have no hestitations recommending this villa to anyone and we are already looking forward to booking our next stay which we will do so directly with the owner. Thank you for making our time in Cyprus so enjoyable! The villa was only a short drive from the airport and very easy to find due to directions provided by the owner prior to our visit. The owner had arranged a car hire which was very resonably priced. There is a driveway at the villa and ample off street parking even at pick up and drop off at the school direcrly across from the villa. The property itself was very spacious with a large living room containing a couch and large dining table. Kitchen had everything needed including a further table, dishwasher and washing machine. The kitchen leads out to the pool area which was well kept and enclosed for privacy. On the upper level there are 2 bathrooms ( also a 3rd toilet downstairs off the kitchen) and 3 spacious bedrooms. Bed sheets and towels were provided and we received the change of sheets after 1 week. There was wifi for a charge and use of a TV with freeview channels. There were also a selection of videos, books and a dvd player. The villa is in a quiet location about a 20 minute walk from the strip and harbour, or a short car journey. Thr pool was cleaned regularly and the owner was very accomodating. Overall the villa is situated in a fabulous location and everything you want for a great holiday would highly recommend and visit again. 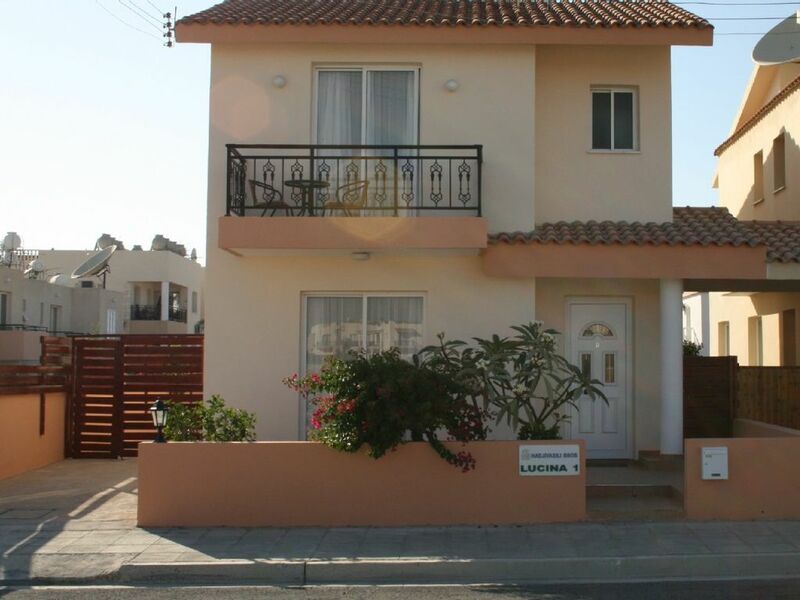 Lucina Villa is in the popular Universal area of Kato Paphos and is a 25 minutes easy walk on the flat to Kato Paphos's many shops, restaurants, tavernas, banks, supermarkets and harbour area making it a superb choice for your holiday. There is a a bus stand 12 minutes walk away with a regular service around Paphos. Like the UK Cypriots drive on the left and car hire is very reasonable. We can provide local car hire details with car collection and drop off at the airport. If you wish to explore more of this beautiful island and attractions by car, the Akamas nature reserve is approximately 15 minutes drive away, the super Water Park is approximately 10 minutes drive and the Troodos mountains (skiing in winter) is approximately 1 hour drive. THE FOLLOWING ARE INCLUDED IN THE PRICE: *Air Conditioning in all rooms* * Unlimited Wi Fi* *UK Broadband TV* *Hand, Bath and Beach Towels * Pool Cleaning & Maintenance * Villa Clean following your departure BOOKING NOTES If booking direct with owner 40% of total cost to secure the villa with balance due 8 weeks before arrival. Deposit is non refundable. There is a £200 Bond Deposit charge which will be returned within 10 days of departure subject to lease terms and keys return. No parties of single males/females permitted. No pets. No smoking directly in the property. ADDITIONAL FACILITIES: Pool can be heated at a cost of £15 per day.